. : S.R.B.É.O. - K.B.G.O.S. :: Acta Orientalia Belgica - Nummer XXVIII :. U kunt dit nummer bestellen vestuur een e-mail à Christian CANNUYER. U kunt ook bestellen per post. Abstract : The study of Jos 22 describes the very importance of the transjordanian Tribes for the entry in Canaan and the fulfillment of the promise of the land. The study goes forth by showing how Jos 22 is a legitimization of the life of the Diaspora in the transjordanian land as a promise land beyond the Jordan river. By enlarging the notion of the promised land, the text legitimates also the cult of yhwh outside Canaan. in enhancing the importance of the Diaspora for the judean community, Jos 22 is a new art of thinking the relationship with the centralized cultic life in Jerusalem. This approach will allow us to question the background of the passage and how he is meaningfully to the final composition of the Pentateuch. Abstract : The wonderful elements in the Gospel accounts of Jesus’ birth are undoubtedly related to oriental and Hellenistic mythological themes. they show, among the first Christians, a “high Christology” claiming the divinity of Jesus. Abstract : This historiographic article aiming to contribute to the history of oriental scholarship in Belgium deals with the birth of the Belgian Society of oriental Studies (1921-), on the basis of an annotated edition of a letter dated december 1920 by the indologist Louis de La vallée Poussin (1869-1938) to the philologist and historian of religions Franz Cumont (1868-1947), in which the former proposes to the latter to become the president of the society of oriental studies he is about to start. Cumont, who was then living in roma (where his archives now lay in the academia Belgica) declined the proposal, and La vallée Poussin was elected president at the inaugural session of the society on the 9th of January 1921. the history of the young society is traced from this time until the death of La vallée Poussin in 1938, using the information provided by several reports of the sessions published in the Revue belge de philologie et d’histoire. the paper gives bio-bibliographical data on the various Belgian scholars more or less involved in the activities of the society, and adds a complete list of the works which were published by the society between 1923 and 1935. Abstract : Evocation of french travelers and writers of the 19th and early 20th century who visited and described bethlehem. in their eyes, bethlehem is first ‘‘the city where Jesus was born’’ and where the Church of the nativity attracts all the attention. but this is not really a real city. it appears to them as a ‘‘museum city’’ that still lives as in biblical times in the heart of a decadent and underdeveloped country. Abstract : The Papyrus Westcar is a narrative text, composed in hieratic script. Attributed to the XVth dynasty, the style and structure lead us to consider it to be based on an original from the Middle kingdom. the story starts at the court of king cheops where four magician's wonders were narrated or performed in front of the king. the tale continues at sakhebou with the magical birth of the three first kings of the Vth dynasty. Many authors tend to consider Papyrus Westcar as a series of fairy tales like Arabian Nights. However this communication seeks on the other hand a global interpretation of the story : the complete Papyrus Westcar aims to glorify the coming of the future kings of the Vth dynasty and to establish their legitimacy to the throne of egypt. Abstract : The myth relating the divine birth of the pharaoh in deir el-bahari, hatshepsut’s in this particular case, is the oldest one which has come down to us in a practically complete version. however this cycle, called “théogamy” in French, is also attested in a few other monuments (Senusret iii, Amenhotep iii, ramesses ii ...) and these make it possible to better understand the flow of the tale. this article will therefore refer to them when necessary. to begin with, this article details the various scenes of hatshepsut’s divine birth. besides describing these scenes, this first part also presents a new reading of a few textual passages. A second part is dedicated to the human characters present in the tale. it is not only about the important role played by Ahmose, hatshepsut’s mother, but also about the place accorded to thutmose ist, her earthly father and to the sovereign herself. Finally, a short ultimate part discusses the possible objectives of these tales of divine birth. Abstract : Basing on the version of the divine birth sequence dating from ramses II that was decorating the temple of tuja, a temple adjoined to the ramesseum on the north, this paper addresses two questions: the prestigious position of the royal women in the Ancient egyptian monarchy; the presence of the earthly parents of the king at the beginning of the divine birth sequences of Amenhotep III and of ramses II. Concerning the position of the king’s wife and mother, it is argued that their prestige is founded on them being the only humans having ever known the god. When examined in the larger context of the birth and coronation sequences of the king, the presence of the earthly parents of Amenhotep III and of ramses II at the beginning of their divine birth sequence can be explained by an evolution leading to a separation between the divine and the human world. the reason for setting such a limit could be sought in a political reaction to the thutmoside period, by which the Ancient egyptian monarchy tends towards a limitation of the influence of the priests over the king’s choice. Abstract : Erment is a Graeco-roman site in the theban area of Egypt. A mammisi, built by Cleopatra vii, the Great Cleopatra, stood there. but khedive ismaël destroyed it in 1861-1863. the temple blocks were taken away for a sugar industry building. so, today, the mammisi is only known by paintings, drawings or photographs. the little sanctuary was very interesting. it was a building made to claim the legitimacy of ptolemy Xv Caesarion, son of Julius Caesar and Cleopatra. it was very typical : there were scenes of milking, nursing, conception, childbirth, labour… like in any other mammisi. but subtle political messages were present. Cleopatra was drawn alone before the gods, like a reining sovereign. she wore the crowns of prestigious queens. Hopefully, recent diggings and complete coverage will contribute to a better understanding of this tiny and interesting temple. Abstract : The aim of this article is to bring some new elements of discussion about the passage concerning the birth and the youth of the king Sargon of Akkad. There are some interests to follow how the myth was gradually born from the first narrative texts telling the deeds and the life of what was a legendary king-hero to the creation of a pure imaginative literary construction in which Sargon became an exceptional champion under the protection of the major gods. The narration of his uncommon birth and youth is fundamental and decisive to introduce the supra-natural character of a human being destined to take the control of the “universe”. During the neo-babylonian period, the exploits of Sargon were deeply transformed with the ideological objective to justify the imperial position of Babylon as heir of the fabulous city of Akkad centre of an universal empire, and stated as have been built by Sargon him self at the same place. Abstract : this paper addresses the particular relationship between a goddess and the assyrian kings esarhaddon and assurbanipal in some passages of the neo-assyrian prophecies. a clarification of the identity of this goddess (is she one and the same in all passages) and of her relationship with the king is necessary. the typical vocabulary of these prophetic passages is therefore searched for in other kinds of documents, among which neo-assyrian letters and poetry pieces. the different roles of the maternal goddesses and of the human, biological mother of the king are also compared. Abstract : This paper presents to the reader a reflection relating to the origin, the miraculous birth of Apollo and Artemis and the significance of their mother Leto. These divine names have no connections with the Greek language. The cultual centers of the triad are mainly located in Asia Minor since the second millenium b.C. Abstract : The birth narrative of Moses, artfully put at the beginning of Exodus (1:1-2: 10), occupies a strategic position. I’ll first analyse the structure of this episode, and then examine through the numerous traceable intertextual references the characterisation of this key figure introduced by the narrative. To start with, I’ll expound the similar and dissimilar features as compared with the birth legend of Sargon of Akkad. Afterwards, I’ll investigate the biblical references, including the Creation, the Flood, the Tower of Babel, the patriarchal narratives and other Exodus passages. What emerges from this study is that the birth narrative must be considered as a prologue to the entire book. The characterisation of Moses, although significant, turns out to be less essential than the general perspective exposing God’s plan of salvation operating in favour of Israel. Abstract : Moses and Samuel are at times compared one to the other because of the divine activity at work in them and their preeminent role in the history of israel. Moses gave the law to israel and Samuel gave birth to the institution of the monarchy. Moreover the activity of God in their lives started at their birth. i propose to consider the narratives of their birth, and the different literary sources that can be identified both biblical and extra-biblical with special attention to the akkadian Legend of the Birth of Sargon. this will serve to highlight the originality of the biblical narrative and the theological strategy making Moses and Samuel ideal kings of the greater divinity Yhwh. Abstract : The conception and the birth of the Buddha, a historical character, and of Temiya, a fictitious character, are accompanied by some wondrous features. Both events are qualified in the texts by the word opapātika « apparitional » i.e. « virginal », namely they take place without the intervention of a father. Both children seem to be conceived each by their mother alone and remain a unique scion (therefore Māyā, Buddha’s mother, is told to have died very soon after the birth of her son). This pattern is found in a series of texts among which some are famous (e.g. the Buddhacarita of Aśvaghoṣa) and, as far as Buddha is concerned, in a lot of carvings spread out over a huge geographical area. These latter are aniconic, when the Buddha symbolically appears as an elephant as in Bhārhut, or is suggested by the bodhi tree or the royal umbrella, like in the stone panel of nāgārjunakoṇḍa; on the contrary, they are iconic when the Buddha appears as a human being, e.g. in the Indo-greek art of Gandhāra. Abstract : The recently discovered Kathisma-church in the neighbourhoud of Jerusalem has been related to the whereabouts of the Holy Virgin according to the Gospel of Pseudo-Matthews. In order to appreciate its significance, we propose that the later tradition of the legend of the Cave of Treasures, as represented by the Opus Imperfectum and the Zuqnîn Chronicle, should also be included in the dossier to fully comprehend its typological theology. Abstract : Since the first centuries of Christianity the miraculous births of Jesus and John the Baptist inspire images of the visit of Mary to elisabeth, both pregnant : Icons, frescoes, illuminated manuscripts, and later altarpieces, stone and wood sculptures. The most astonishing ones are those where the infants about to be born are visible in or in front of the body of their mother. Christian art has created this type of representation probably in the Orient where it remained rare and from where it has transmitted itself into the Occident by passing via the Balkans. It then spread in the germanic regions of the high middle ages and meets the desire to unite mystically the soul to God and to see the Incarnation. Devotional practices do not only make visible but also palpable and manipulable – puppets, cradles – the body of the infant Jesus. Abstract : Fenqitho is the name of a large collection in the Syriac Liturgy. We record the presence of a considerable number of hymns which are sung during the offices of this collection and signed by Ephrem (+ 373), the famous Syriac Church Father. 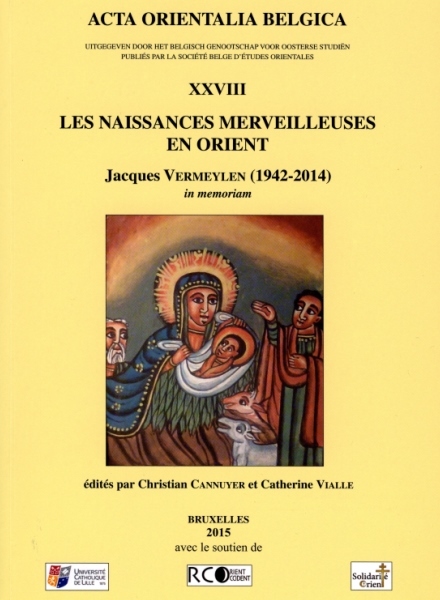 This study tries to approach the role of the Syriac Liturgy in the transmission of the Madrōšē of Ephrem, and aims to show the literary importance of the tradition of Fenqitho in the Syriac Churches, which still widely an understudied field. The answer is searched by an attempt of authenticity analysis of these hymns. Their belonging to Ephrem is identified according to four criteria: stylistic and literary, terminological and linguistic, and finally theological. Considering the abundance of the texts, this study deals with the hymns of the Nativity, cited in the second volume of the collection of Fenqitho of Mosul. I took the only critical edition of the Madrōšē of Ephrem, done by Edmund Beck and published in the CSCO in 1959, as a landmark for this study. Abstract : The miracle of the displacement of the al-Muqaṭṭam hill by the patriarch Afrahām ibn Zur‘a in the 10th century is still alive today. the main source for this miracle account is found in the corpus of the History of the Patriarchs of Alexandria. Based on the manuscript Paris arabe 282, this article highlights an independent elaborated version of the biography of this patriarch as compared to the primitive recension and the “pseudo-Vulgate” version. From the historical point of view, the miracle seems to have been used as a guarantee for the presence of the Christians in egypt at that time. on the other hand, the miracle story reflects the relationship between the three communities in egypt: Christians, Jews and Muslims and aims at proving the truthfulness of the Christian Faith. Abstract : The Histories of the Prophets recorded different kinds of narrations about the Prophets who appear in the history of the revelation according to Islam. Concerning the birth and the childhood of Jesus, we find traditions that clarifie the Qur’anic verses but also narratives from apocryphal Christians legends. These compendiums don’t show a wish of harmonisation but rather a compilation of stories. The birth as such is not described explicitly, the general circumstances are portrayed without taking into account the timing of the events. Abstract : Our approach of the texts surrounding the birth and childhood of the Prophet MuÌammad in the Sîra, is more literary than historical. It seemed appropriate to revisit these texts, well known to scholars, in an intertextual perspective that tends to establish any formal or substantial link with the biblical literature. After the genealogies, we present successively the announcements and the warning signs of the Prophet’s birth, the stories of the events with their cosmic and wonderful character, and finally the episode of the monk Bahira. Our investigation has brought new elements, especially the clear link between the episode of the dream of King Rabi’a and the text of Daniel. This is the first time, it seems, that this is highlighted. In addition, we found a few direct or allusive references to the books of Genesis, Jonah, Daniel and the Psalms, and the Gospels of Matthew, Luke and John. Abstract : Early Shīءī traditions relating the miraculous birth of the Imams influenced Ismāءīlī Ṭayyibī authors from Yemen, starting with al-Ḥāmidī (d. 524/1130), as they developed a complex doctrine about the generation of the two natures – human (nāsūt) and divine (lāhūt) – of the Imams. The originality of this system appears in the idea that the Ṭayyibī initiates, after their death, are undergoing a transformation leading to the formation of both natures. The camphorate body (ǧism kāfūrī) of the Imam, which is his nāsūt, is produced from the pneumatic soul (al-nafs al-rīḥiyya) of the elected, mixed with the food and drinks of the Imam’s parents after it had been purified by the Moon and the Sun. The divinity of the Imam is build, as a Temple of light (haykal nūrānī), with the purified souls of the elected. The Imam receives this Temple, and hence his divinity, from his father at the moment of his designation (naṣṣ). Abstract : The Bektaşi tarikat (order), which appeared in Anatolia in the 14th century and spread in the ottoman Empire in parallel with the janissaries in the 15-16th centuries, considered heterodox Shia and ghulât (extremist) by Sunnî ulemas has been repressed since the beginning of Tanzimat reforms (1826), officially forbidden in Turkey in 1925, lately in Balkan countries during the communist era. Texts were hidden and kept secret. for the last 25 years, there has been a revival of research on Bektaşi traditions. A number of texts mention legends (menâkibnâme) related either to traditional prophets (Mohamed, Ali, Miriam) or the eponym founder of the tarikat, Hacı Bektaş-i Veli, and to his immediate successors in the leadership of the tarikat have been recently published. Several of these legends deal with marvellous births carried by women around the prophets, getting pregnant thanks to blood or honey; other describe men getting miraculously pregnant. reflecting more ancient religious legends of the geographical area, they also show the vitality of intellectual creation in circles far from Muslim orthodoxy controlled by the political leaders.